“What does one mean by hydrostatic pressure and hydrostatic level measurement?” But how do you measure the level of water and other liquids using pressure sensors? For use in open geometries such as vented vessels, open reservoirs and tanks, but also wells and open bodies of water, instrumentation manufacturers such as WIKA offer submersible pressure transmitters, also known as level probes, specifically developed for this purpose. Submersible pressure transmitters are completely immersed in the liquid that is to be measured. In closed geometries, such as enclosed tanks and vessels, generally, flush pressure sensors or pressure transmitters are used, which can be screwed into the vessel from the outside. Pressure sensors are therefore particularly suitable in applications of free-standing tanks and vessels. A submersible pressure transmitter (e.g. WIKA model LH-20) or a flush pressure sensor (e.g. WIKA model S-11) measures the height-dependent weight-force of the liquid column, also known as hydrostatic pressure. This pressure measurement is directly proportional to the liquid level respectively liquid column at the measuring point of the pressure sensor. It is therefore necessary, for the measurement of level, that the pressure sensor is placed as close as possible to the level of the vessel’s bottom. 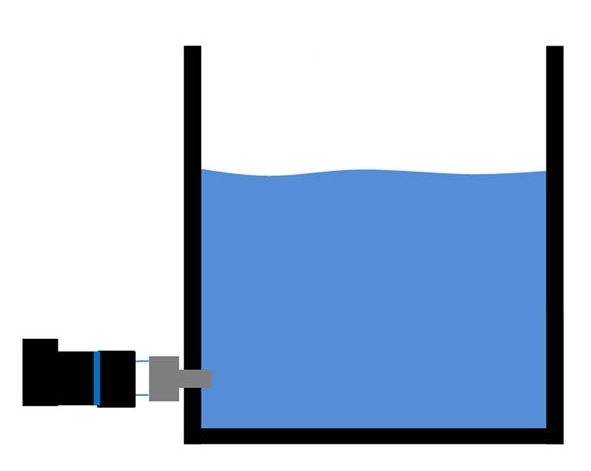 The measured hydrostatic pressure then directly corresponds to the height of the liquid column from the ground-level measurement point to the surface-level of the medium. So, the filling height is calculated from the distance of the medium surface to the measuring point by the pressure measurement. The weight force of the liquid column, thus the hydrostatic pressure, however, is not only directly proportional to the filling height, but also varies with the specific gravity of the medium and the force of gravity. In the next article I will explain in detail the calculation of the liquid level, especially with reference to the influence of the specific gravity of the medium.